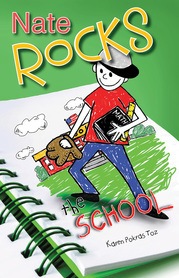 Nate Rockledge and gang are back in the third volume of the Nate Rocks series, Nate Rocks the School by Karen Pokras Toz. Now in fifth grade, Nathan, Tommy, and Sam are glad to take advantage of being older. 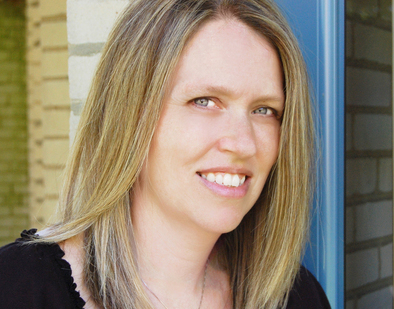 Mom finally concedes to having Nate’s birthday party outside of the house for once. There’s baseball at recess and a cool Halloween dance to help the class raise necessary funds for the annual fifth grade trip to New York City. But when the trip to NYC is at risk of being canceled, Nate steps up to help with the fundraising committee. With paper and pencil in hand, Nate Rockledge becomes Nate Rocks, saving the town from evil robots and helping recover stolen paintings and cars. I’ve enjoyed this series since the beginning. In this latest book in the Nate Rocks series, Toz lets loose her imagination and sense of humor once again to come up with a great middle grade adventure story boys will love. Familiar and new characters blend together in this zany story filled with Nate’s mom’s horrible cooking, whiny complaints from know-it-all Lisa Crane, annoying older sister jabs from Abby, Dad’s poor storytelling, and the adventures of one creative boy stuck in the middle of it all. A neat surprise ending winds down this story that moves along at a good clip. This series keeps getting better and better. I can’t wait to see what Nate is up to next. Hey everyone – it’s me, Lisa Crane. For those of you who have been following this tour, I need to set the record straight. You know what they say – there are two sides to every story. 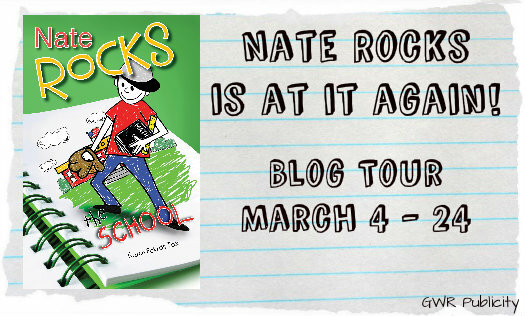 In fact, the only thing in the book, Nate Rocks the School, that’s actually accurate about me is the part where I tell everyone how Nathan got his black eye last summer. Even Abby said it was true, so it must be, right? Anyway, Nathan makes it sound like he’s doing all the work to try to raise the money we need for our school trip to New York. Well that’s just not true. In fact, if anything, he’s making even more work for us. Yup, that’s right. For example, it was his idea to have two school events, not one. He’s the one who made us do things on such short notice, and he also did a lousy job trying to get donations. Then to make things even worse, Nathan’s mom insists on making all the food that we’ll sell at the snack table. (Between you and me, everyone in the school knows to stay away from Mrs. Rockledge’s baked goods – even my mom knows that, and she’s Mrs. Rockledge’s best friend!) We’ll barely make any money from snack sales, and that’s usually a big seller! If you ask me, my ideas for fundraising are so much better. If only Nathan and that best friend of his, Tommy, would listen to me. We’d be done already. When will those boys learn? Anyway – I guess if you want to see how it all turns out, you’ll have to read the book. Just remember what I told you! I received an e-copy of this book from the author through GWR Publicity. This review contains my honest opinions, for which I have not been compensated in any way. A Nate Rocks Swag Pack. 1) Visit Karen’s website at www.karentoz.com and leave a comment at this post telling me something you learned while there. Be sure to leave your email address so I can contact you if you win. 2) Winners must be 18 years of age or older and reside in the United States. 3) Prize will be shipped directly to the winner by the author or her representative. 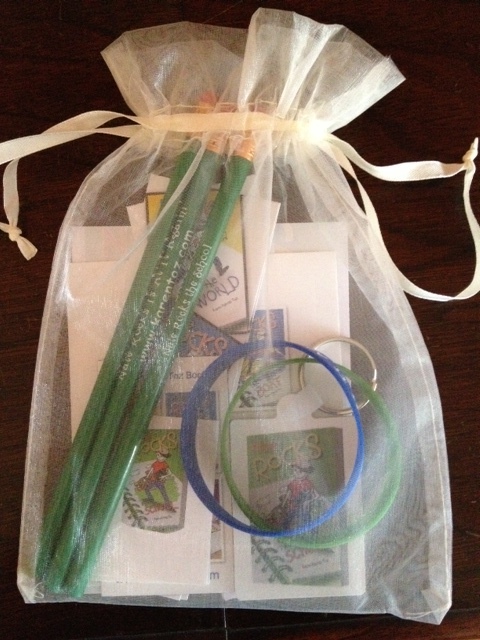 Grand Prize: One reader will win a $25 Amazon Gift Card and Nate Rocks Swag Pack. I learned that I’m behind in my Nate books. What a neat series. I must check it out for my grandsons, one in 4th grade, the other in 6th. Sounds just right for them. I learned the books have won several nice awards. I’m also following on Good Reads now. Thanks for the comments, ladies. I had a chance to help promote the first Nate book when it came out. It’s wonderful seeing more books in the series. I love it when authors create a great brand.